The 'review' part of this post will be brief as there's not a great deal to say about an official strategy guide. 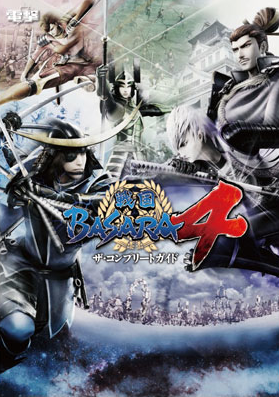 Sengoku Basara 4: The Complete Guide was published back on 22nd February 2014 by ASCII Media Works under the Dengeki label. It was priced at ¥1,800 and is still readily available from most online stores, including CD Japan, Amazon Japan, Yesasia Global and HMV Japan. The book is thick at 400 pages and contains exhaustive lists of just about every possible piece of information a person could want to know about Sengoku Basara 4; it's much more detailed than V Jump's earlier Sengoku Basara 4 PS3 Edition: Sengoku Sousei Eiyuutan Dramatic Heroes Guide. If you can only buy one of the two and want a detailed resource to go with the game, I'd recommend this one. My first edition copy also included a Shibata Katsuie bookmark, which was a pleasant surprise! It seems that there are at least three bookmark designs available since commenter VegaManX4 received Sakon instead and I've seen talk of a Masamune design elsewhere. There's probably a Mitsunari bookmark available as well. Another bonus comes in the form of six Mame Sengoku Basara 4-panel comics strips right at the end of the book. They're very simple gags which parody certain moves and scenes from the game; even though they're drawn more simply than the regular series, they're a welcome addition. I can't even begin to fully summarise the new information contained in this book - and I wouldn't particularly want to annoy the publishers by trying - but there are some important details which I think that other fans would like to know. I'm going to make a few translated notes which might make it a little easier for people trying to track down all of the game's secrets through the language barrier. First of all, some general facts. Kyougoku Maria's element is officially wind. Ashikaga Yoshiteru's is 'all of them'. Naoe Kanetsugu's element is 'invincible'... as is his attack power, movement speed, etc. His character profile is taped into the book after the official ones and it looks as though he added it himself. As many people have suspected, there are official 'tiers' for how strong each warrior is in a kengeki sword clash. Hideyoshi, Tadakatsu and Yoshiteru are all regarded as 'A' rank and the list extends down to Oichi, Tsuruhime and Kingo who are all considered 'F' rank. The higher tier characters win clashes more easily, deal more damage upon victory and gain significantly more of a boost to their Style Gauge. Although all weapons can be made equal in the end, each different weapon type is linked to specific inscriptions and statistics. For example, if you're looking for the 'Six Realms' inscription you should be looking for the blue 'Derivation' battles as much as possible and playing on Basara difficulty. It only ever appears on the characters' sixth weapons in Normal difficulty so it will be exceptionally hard to find it that way. The chance of success with the 'Change' inscription is greatly affected by the quality of the inscription you combine it with. Using it on the gold-coloured inscriptions means that you'll get a green-coloured inscription as a reward approximately half of the time (even when the gold-coloured inscription hasn't been upgraded to the 'Extreme' version). The bulk of the new information is about the game's stages. The stage selection system in Sengoku Basara 4's Sengoku Creation mode has confused a number of people, so I think I'll try to explain how it works using my experience and the data in the book. I'll start with the basics. You will always be given a maximum of six stages to play through in Sengoku Creation mode. If your character is one of those with alternate routes, you'll be prompted to choose your Drama (blue/white scroll) or Anime route (red/white scroll) after the third battle. Unlike most stages in a normal ('Creation') route, the stages for Drama and Anime routes are predetermined. If you're looking for a particular stage, don't play one of its boss characters or the stage won't appear (obviously). It's best to play as someone from an enemy faction! The Outbreak (red) stages can either appear at random based on the actions of other armies or as a result of you ignoring the random Omen (purple) stages. The Omen (purple) battles which appear during your campaign will lead to specific encounters if you ignore them. Clearing certain stages can cause specific Derivation (blue) stages to appear afterwards. In some cases, a single stage can lead to a chain of up to three related battles. With that out of the way, I'm going to present the next set of information in a huge list. We now have confirmation of how to achieve some of the more obscure special challenges on each stage - as well as the conditions for triggering the stages in the first place. It's more obvious in-game if you can understand Japanese since the battle reports announce the developments before each stage appears with a cutscene. Can lead to Toyotomi Reminiscence Struggle if you don't clear the Omen (purple) version. Can lead to a chain of Iyokouno Ship: Tsurunomaru followed by Remains of Ounin: Souden. Can lead to Floating Fortress: Tenkuu Nichirin if you don't clear the Omen (purple) version. Can lead to either Osaka: Dragon-Tiger Formation or Battle of Sekigahara: Western Shadow. Can lead to either Tootoumi: Iinoya Castle or Pirate Fortress: Hyakki Fugaku. Can lead to either Oumi: Sawayama Castle or Osaka: Toyotomi Hajou. For the second objective you have to take the first two camps (meat and fish) within 40 seconds of the scene where Hideaki comes out and shouts at you. Can lead to either Incident at Honnouji or Minstrel: Pale Blue Bellflower. Can lead to either Kawanakajima: Uesugi Battle Formation or Oushuu: Aoba Castle (Matabee Intrusion). Can lead to either Oumi: Sawayama Castle or Fate: One-Eyed Dragon. There are thirty different rooms in this stage: the starting area and boss room, and twenty-eight others which depend on whether you pick black or red, and whether you win or lose the bet. Picking the right colour is simply a matter of timing. If you're struggling to time the doors, you can try exploiting Maximum Style mode with inscriptions and play books to give yourself a boost. Can lead to either Kaga: Maeda Kabuki-Matsuri or Incident at Honnouji. There are only only sixteen different rooms since guessing the wrong colour doesn't change the layouts this time. The version of Sourin you need to defeat for this stage's second bonus objective is hiding in a specific room with the (Ryaku) Omoide-gou tank. To reach him you need to stop all of the doors on red - this will also clear the other objective at the same time. Can lead to either Hinomoto Tunnels: Josui Line or Ootomo Xavi Land: Closed. Can lead to Oushuu: Aoba Castle. Can lead to either Aki: Itsukushima, Ootomo Xavi Land: Closed or Satsuma: Inner Castle. Can lead to either Shizugatake: Advance of the Oda Vanguard or Oushuu: Aoba Castle (Matabee Intrusion). Can lead to either Oda: Azuchi Castle or Minstrel: Pale Blue Bellflower. Can lead to either Izumo: Shiraga Castle or Kaga Border: Shizugatake. Can lead to a chain of Tango: Sengenji followed by Kaga Onsen: Gathering Of Maidens. Can lead to either Investigation: Shikanosuke or a chain of Aki: Itsukushima followed by Ootomo Xavi Land: Closed. Can lead to a chain of Fate: One-Eyed Dragon followed by Abrasion: The Beauty of Insufficiency and then Takeda Otoko Dojo. Can lead to either Shizugatake: Advance of the Oda Vanguard, Pirate Fortress: Hyakki Fugaku or Bizen: Ujou (Okayama Castle). Can lead to Kaga: Maeda Kabuki-Matsuri if you don't clear the Omen (purple) version. To peep on Maria in the bath, you have to beat Naotora within six minutes of starting the stage. Maria will appear in a special room. If you defeat Tsuruhime or Magoichi within 45 seconds of encountering them, there will be more treasure hidden around the stage and you'll be able to take a shortcut to Naotora. Can lead to either Tootoumi: Iinoya Castle or Kaga: Maeda Kabuki-Matsuri. Can lead to either Kaga Border: Shizugatake or Kaga Onsen: Gathering Of Maidens. Can lead to either Kawanakajima: Uesugi Battle Formation or Jigen: Oni Shimazu. To open the 'Inscrutable as a Shadow' door you have to beat Yukimura within 30 seconds the second time he appears. Can lead to either Fate: One-Eyed Dragon, a chain of Osaka: Toyotomi Hajou followed by Battle of Sekigahara: Eastern Sun or a chain of Takeda Otoko Dojo followed by Jigen: Oni Shimazu. Can lead to either Osaka: Dragon-Tiger Formation or Kawanakajima: Takeda Battle Formation if you don't clear the Omen (purple) version. Can lead to either Tootoumi: Iinoya Castle or Takeda Otoko Dojo. Can lead to either Kawanakajima: Takeda Battle Formation, Revenge: The Sword of the God of War or a chain of Floating Fortress: Tenkuu Nichirin followed by Remains of Ounin: Souden. Can lead to Kawanakajima: Takeda Battle Formation. Can lead to Tootoumi: Iinoya Castle. Can lead to Battle of Sekigahara: Eastern Sun if you don't clear the Omen (purple) version. Can lead to either Azuchi-Shiten Gathering or Bizen: Ujou (Okayama Castle). Can lead to Incident at Honnouji if you don't clear the Omen (purple) version. Can lead to either Abrasion: The Beauty of Insufficiency or a chain of Tango: Sengenji followed by Azuchi-Shiten Gathering. Can lead to Shizugatake: Advance of the Oda Vanguard if you don't clear the Omen (purple) version. Can lead to either Eiroku Palace: Samsara or Tango: Sengenji. The outcomes of the three reels are random. The first reel sets the music. It can be Waltz (angry soldiers), Dance (dancing soldiers) or Hymn (angry Sourin). The second sets the script. It can be Prayer (exorcists which slow movement), Battle (hammer-wielding soldiers) or Comedy (foot soldiers with cannons). The third reel sets the scene. It can be Exciting (bombs drop from overhead), Romantic (soldiers appear from the ferris wheel) or Fantastic (items and Xavi dolls drop down). Can lead to either Dewa: Mogamigawa or a chain of Jigen: Oni Shimazu followed by Eiroku Palace: Samsara. Can lead to Ootomo Xavi Land: Closed if you don't clear the Omen (purple) version. Can lead to either Echizen: Kitanoshou Castle or a chain of Kaga: Maeda Kabuki-Matsuri followed by Battle of Sekigahara: Western Shadow and then Battle of Sekigahara: Eastern Sun. Can lead to either Toyotomi Reminiscence Struggle or Hinomoto Tunnels: Josui Line. Can lead to either Toyotomi Reminiscence Struggle or a chain of Osaka: Toyotomi Hajou followed by Battle of Sekigahara: Eastern Sun. Can lead to either Battle of Sekigahara: Western Shadow or Echizen: Kitanoshou Castle if you don't clear the Omen (purple) version. Can lead to either Dewa: Mogamigawa or a chain of Mikawa: Komaki-Nagakute followed by Battle of Sekigahara: Western Shadow. Can lead to Osaka: Dragon-Tiger Formation if you don't clear the Omen (purple) version. Can lead to either Floating Fortress: Tenkuu Nichirin, Iyokouno Ship: Tsurunomaru or Satsuma: Inner Castle. A lot of people have debated the exact requirements for having Yoshiteru acknowledge your 'mind, skill and body'. It states the basic requirements as you play but there's more to it than that. Yoshiteru gives you points based on how well you perform at a number of tasks and acknowledges your worthiness if you make enough progress. Yoshiteru will acknowledge your 'mind' if you manage to beat Shikanosuke within one minute the first time he appears. There will be an on-screen confirmation message. You get 10 points for beating Shikanosuke within 30 seconds of starting the level, or 5 points if you can do it within a minute. After the first gate opens, you get 5 points for defeating Shikanosuke (again) within a minute. Yoshiteru will acknowledge your 'skill' if you achieve a 1,000-hit combo after the Azai couple appears and before you defeat them. You get 5 points if you can achieve this and defeat Oichi and Nagamasa within a minute of their arrival. You get 10 points if you defeat 400 or more enemies between passing through the third gate and killing the guard at the fourth gate, or 5 points if you only defeated 200-399 enemies. Yoshiteru will acknowledge your 'body' if you have defeated more than 200 enemies at this time. Defeating Maria within a minute of her appearance is worth 5 points. At the end of the stage, Yoshiteru will rate you based on your performance and your score will affect the final confrontation; less than 15 points and he'll 'power up' when he has 20% HP remaining, 15-24 points and he'll do it at 40%, and 25 or more points and he'll 'power up' at 60%. Can lead to either Battle of Sekigahara: Eastern Sun or Osaka: Dragon-Tiger Formation. Can lead to either Floating Fortress: Tenkuu Nichirin or Kaga Onsen: Gathering Of Maidens. Can lead to either Remains of Ounin: Souden or Ootomo Xavi Land: Grand Opening. Can lead to either Izumo: Shiraga Castle or a chain of Hinomoto Tunnels: Josui Line followed by Ootomo Xavi Land: Closed. Can lead to either Oda: Azuchi Castle, Echizen: Kitanoshou Castle, Tango: Sengenji, Minstrel: Pale Blue Bellflower or Kaga: Maeda Kabuki-Matsuri. Can lead to either Kai: Tsutsujigasaki Yakata or Kai: Takeda Grudge Time. Can lead to either Remains of Ounin: Ginga, Toyotomi Reminiscence Struggle or a chain of Investigation: Shikanosuke followed by Remains of Ounin: Ginga. To make Yoshiteru 'kneel' you have to parry him so he staggers. As this can be tricky, the book recommends taking a character with a light-elemental inscription on their weapon to gain an advantage. Can lead to either Echizen: Kitanoshou Castle, Oda: Azuchi Castle, Kai: Tsutsujigasaki Yakata, Aki: Itsukushima, Iyokouno Ship: Tsurunomaru, Bizen: Ujou (Okayama Castle) or Jigen: Oni Shimazu. The requirement for triggering Tadakatsu's 'intrusion' on Tootoumi: Iinoya Castle is to reach Naotora within five minutes. There's an exception in one of the Anime routes when the intrusion will happen no matter how long you take for story reasons. Can lead to either Mikawa: Komaki-Nagakute, a chain of Tango: Sengenji followed by Kaga Onsen: Gathering Of Maidens or a chain of Kai: Takeda Grudge Time followed by Takeda Otoko Dojo. There's a special rule for deriving Mikawa: Komaki-Nagakute after completing Tootoumi: Iinoya Castle. If you got to Naotora in time to fight Tadakatsu, you'll get the normal version of Mikawa: Komaki-Nagakute. If you took too long, you'll get Mikawa: Komaki-Nagakute (Matabee Intrusion) instead. Can lead to Kai: Takeda Grudge Time if you don't clear the Omen (purple) version. Can lead to either Eiroku Palace: Resolution, Oumi: Sawayama Castle or Osaka: Dragon-Tiger Formation. If you can read Japanese or really love detailed lists of statistics then I definitely recommend picking up a copy of the guide if possible; the sheer amount of data it contains is incredible. can you elaborate on Hyakki Fugaku and Tenku Nichirin's timed objectives? they sound a bit vague, how fast do we need to do the missions in Hyakki fugaku and when does the timer starts, before or after the 300 soldiers bit? and do we need to beat Motonari 30 seconds from the start of the countdown or stall the fight until the countdown shows only 30 seconds left? On the Hyakki Fugaku stage you have seven minutes after you pass through the special door which closes 30 seconds after the stage starts. You have to kill three specific soldiers called 資材運搬兵, all of whom are in the platform area after you open the 300 soldier door. They're the guys carrying the blue boxes. If you are successful Hyakkimaru will have lower hit points when it appears. For Tenkuu Nichirin, the counter has to have more than 30 seconds left on it when Motonari is defeated to achieve the bonus objective. sometimes i managed to beat Hyakkimaru with just one Giga Basara attack at the start of the battle(on Basara diff), but i didn't get a "mission clear", i guess i went over 7 minutes but managed to beat most of the blue box guys..
any more interesting stuffs from the books that you care to share with us? infos for shikamaru is amazingly scarce on even JP wikis, does the guidebook have a more detailed stuff on him? Once I have a better grasp of his moveset I'll take a look and see if there's anything which could use translation from the article! Great work as always! Thank you for all your efforts. Is there a detailed description with each level bonus objectives? I managed to find secret routes at Li Naotora and Tsuruhime's levels for example. Are they part of that objectives? I do not read JP so I can not understand the statistics at the end of the battle. I am a little confused with the fugitives. Sometimes when I kill a fugitive i get only a small reward, no mark on the screen and no mark on the bingo table afterwards. Do they reappear? Thank you for your comment! The secret areas in Ii Naotora's route are just for fun, but Tsuruhime's are sometimes important for finding all of the hidden bells you have to ring. The statistics and stage objectives can be seen here but I haven't fully described each one. The guys at Koei Warriors describe Tsuruhime's objectives in more detail here too. If you don't get a big mark on the screen it means you already killed that fugitive. You might find this chart useful for keeping track of which ones you have already found in your bingo book. Thanks. Now I seem to understand the fugitive chart. I would like to ask something about amazon.jp, can i send you an e-mail? Please contact me at kastaykov@gmail.com if you prefer. Sure, I'll send you an email now. can you please tell us the character-tier list for the "kengeki sword clash"-ranking? Nah, I'm not really a huge fan of guides). I think I only own like 4 books, max (FFVII - bought out of nostalgia, SFIV and USFIV - bought for frame data and stuff, and SB4 which I just couldn't resist buying, lol). Concept art is what I'm really digging in terms of VG related books. Nice work, I wonder how they chose who's stronger at clashes. wouldn't have guessed keji and motochika are more harder to beat than masamune and mistunari. By the way, according to the newest version of the guide Sen No Rikyuu is D-rank. Thank you for asking! I've just added it to the guide now in a special section at the end of the Stages chapter. The special objectives are a little unusual for this encounter so I hope it helps; you need to win using a specific move and get over 200 kills to obtain both of the bonuses. - Can lead to either Oumi: Sawayama Castle or Battle of Sekigahara: Western Shadow. - Can be triggered by clearing Sawayama Castle: Chouhan Defense, Battle of Sekigahara: Eastern Sun or Itsukushima Sanbee Occupation. - Can also appear if you don't clear the Omen (purple) version of Osaka: Toyotomi Hajou. - Can lead to either Kai: Tsutsujigasaki Yakata, Takeda Otoko Dojo, Kai: Takeda Grudge Time or Revenge: The Sword of the God of War. - Can be triggered by clearing Naotora Women's Dojo or Tootoumi: Iinoya Castle. - Can lead to either Osaka: Toyotomi Hajou or Battle for the Nation's Peace. - Can be triggered by clearing Hinomoto Tunnels: Josui Line or Osaka: Toyotomi Hajou. - Can lead to either Kai: Takeda Grudge Time or Battle of Kawanakajima: Intrusion. - Can be triggered by clearing Kawanakajima: Takeda Battle Formation or Osaka: Dragon-Tiger Formation. - Can also appear if you don't clear the Omen (purple) version of Tootoumi: Iinoya Castle. - Can lead to either Dewa: Mogamigawa or Fate: One-Eyed Dragon. - Can be triggered by clearing Fate: One-Eyed Dragon or Osaka: Dragon-Tiger Formation. - Can also appear if you don't clear the Omen (purple) version of Dewa: Mogamigawa. - Can lead to either Bizen: Ujou (Okayama Castle) or Battle for the Nation's Peace. - Can be triggered by clearing Bizen: Ujou (Okayama Castle), Battle of Sekigahara: Western Shadow or Echizen: Kitanoshou Castle. - Can also appear if you don't clear the Omen (purple) version of Oumi: Sawayama Castle. Could you translate all words in "Ootomo Xavi Land: Grand Opening " stage?